This outstanding, self-working card trick is as simple as it is amazing: a spectator shuffles an ordinary pack and then selects the PERFECT card to complete a Royal Flush. As with all of Benjamin Earl's superlative work, the aesthetic is casual and, above all, believable. This effect feels less like a magic trick and more like an actual demonstration of an extraordinary, real moment. 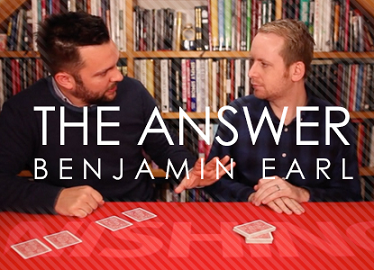 "The Answer" is entirely self-working, and can be done with any borrowed pack of cards. In 30 detailed minutes, Ben takes you through the effect in great detail, supplying all the nuances that he has gleaned in over a decade evolving and performing "The Answer."